You are welcome to contact us whatever your enquiry. Between our UK and US office we are open for business some 20 hours per day. Our UK offices and showroom is open Monday to Friday 0830 to 1730 UK time, however we can meet you outside these times by arrangement. 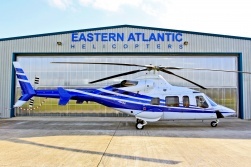 Our purpose-built showroom hangar is located in the southwest corner of Shoreham Airport (EGKA). If you are flying in please make initial contact with ATC on 123.15 and after arrival request taxi to Eastern Atlantic. We have a private apron and can accommodate helicopters or fixed wing visitors. If coming by car we are located only 30 minutes drive south of London Gatwick Airport. You can use the interactive Google Map below to intiate a route planner. However you arrive... we look forward to seeing you! For general enquiries please use the contact form below. We will reply as soon as possible. We carry many hard to find parts in stock, particularly in the case of Enstrom, MD500 and MD900 P/Ns. Click here to use to search our current stock. We are competitive, resourceful and experienced.